The U.S. Department of Health and Human Services reports that approximately 13 million people in the United States suffer from urinary incontinence with the condition being twice as prevalent in women then men. There is a misconception among women that this condition typically affects the older population. The fact is urinary incontinence affects women of all ages. When you can’t control the release of your urine, you have urinary incontinence. Incontinence can range in severity from a few dribbles to complete loss of urine control. Of the several types of urinary incontinence, stress, urge, and mixed incontinence account for more than 90 percent of cases. Stress incontinence. This is loss of urine when you exert pressure — stress — on your bladder by coughing, sneezing, laughing, exercising or lifting something heavy. It has nothing to do with psychological stress. Stress incontinence occurs when the sphincter muscle at the bladder is weakened. The problem is especially noticeable when you let your bladder get too full. Physical changes resulting from pregnancy, childbirth and menopause can cause stress incontinence. Urge incontinence. This is a sudden, intense urge to urinate, followed by an involuntary loss of urine. Your bladder muscle contracts and may give you a warning of only a few seconds to a minute to reach a toilet. With urge incontinence, you may also need to urinate often. The need to urinate may even wake you up several times a night. Some people with urge incontinence have a strong desire to urinate when they hear water running or after they drink only a small amount of liquid. Simply going from sitting to standing may even cause you to leak urine. Many women describe “key in the door” urge incontinence. Mixed Incontinence. Mixed incontinence is a combination of both stress and urge incontinence. Many women suffer from both conditions. It should be noted that each condition needs to be addressed and treatment separately. Consultants in Urology – a division of Premier Urology Group – is committed to providing you with the latest diagnostic testing and treatment options. Accurate diagnosis is accomplished through an extensive history taking, physical examination (especially a thorough pelvic examination), and other diagnostic tests such as cystoscopy, urodynamics, post-void residual measurements, ultrasounds, pad tests and bladder diaries. We are proud to offer the most advanced technology in urodynamics with both video urodynamics and non-video urodynamics. Once an accurate diagnosis is made treatment can be offered. Treatment options for urge and stress incontinence vary. Kegels Exercises. These exercises strengthen your urinary sphincter and pelvic floor muscles — the muscles that help control urination. To do pelvic floor muscle exercises, imagine that you’re trying to stop your urine flow. Squeeze the muscles you would use and hold for a count of 10. Relax, count to 10 again, then repeat. You can do these exercises almost anywhere — while you’re driving, watching television or sitting at your desk at work. Biofeedback. Sometimes we will recommend that you perform the pelvic floor muscles exercises with a trained medical professional. The patient is taught how to properly perform the exercises. The patients will also receive feedback on how the muscles are strengthening. In addition to active exercises the muscles are strengthened passively through electrical stimulation. Biofeedback improves patient compliance and offers audio and visual feedback. Medications. Currently there are NO FDA approved medications for the treatment of stress urinary incontinence. Urethral Sling Procedure . The majority of patients with stress incontinence, cure is only a simple surgery away. During this urethral sling surgery, a strip of synthetic mesh material is placed under the urethra via a 1cm vaginal incision. The strip acts like a hammock, compressing the urethra to prevent leaks that occur with the activities of daily living. Success rates for urethral sling surgery approach 98% in the properly selected patient. Urethral slings are performed as outpatient surgery, take approximately 10 minutes, and require no catheter. Patients return to their normal daily activities within days. Consultants in Urology, a division of Premier Urology Group, places retropubic or trans-obturatorurethral slings with outstanding results and minimal to no complications. These synthetic slings have been available for greater than 10 years. They have been effectively placed in greater than 1 million women. Urethral Bulking Agents. This treatment is indication for patients with stress incontinence or for a small subset of patients with a condition termed Intrinsic Sphincter Deficiency (ISD – failure of the urethral walls to effectively contact each other). This is a 5-10 minute procedure done under light anesthesia. Through a telescopic camera, a bulking agent, such as collagen, is injected into the tissue around the urethra to cause urethral compression and reduce the degree of urinary incontinence. Unfortunately, the collagen dissolves away over time and repeat injections may be required every 6-12 months. Newer agents are now being used such as, Coaptite®, as they have longer term results and require fewer repeat injections. Oral Medications. Several oral medications are currently available for the treatment urge incontinence. These medications are referred to as anti-cholinergics. They are designed to reduce the over-activity of the bladder muscle thereby reducing the sensation to void without a full bladder. They also help increase the interval time between voids and the number of incontinence episodes. These medications can take several weeks to achieve their full effect. Patients may have to try a few different medications before they find one that achieves good control with few side effects. The most common side effects are dry mouth, dry eyes and constipation. Bladder Retraining. This modality is usually performed in our office with a medically trained professional. When done in combination with biofeedback bladder retraining has good results. It involves learning to delay urination after you get the urge to go. You start by trying to hold off for 10 minutes every time you feel an urge to urinate. Then try increasing the waiting period to 20 minutes. The goal is to lengthen the time between trips to the toilet until you’re urinating every two to four hours. It may also involve double voiding — urinating, then waiting a few minutes and trying again. This exercise can help you learn to empty your bladder more completely to avoid overflow incontinence. In addition, bladder training may involve learning to control urges to urinate. When you feel the urge to urinate, you’re instructed to relax — breathe slowly and deeply — or to distract yourself with an activity. Doing a kegel exercise during the urge to void can also help. 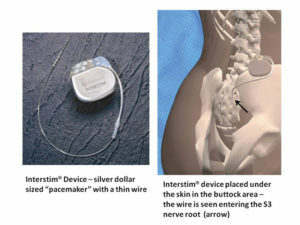 Sacral nerve stimulator (Interstim®) – . This small device acts on nerves that control bladder and pelvic floor contractions. The device, which resembles a pacemaker, is implanted under the skin in your buttock area. A wire from the device is connected to a sacral nerve — an important nerve in bladder control that runs from your lower spinal cord to your bladder. Through the wire, the device emits electrical pulses that stimulate the nerve and help control the bladder. The pulse doesn’t cause pain and provides relief from urinary incontinence and the urgency and frequency of urination. The initial testing is performed in the office and during this first stage, or trial stage, the electrical lead is inserted in the proper position and connected to an external battery. Over the next week the patient keeps a bladder diary to determine the effectiveness of the device. If improvement occurs then an outpatient procedure under light anesthesia is performed to implant an internal battery. Botulinum Toxin A Injections. Currently botulinum toxin A injections for the bladder are not FDA approved. Despite this many patients opt to proceed with this therapy as the results are promising for severe overactive bladders that do not respond to oral medication. Under light anesthesia, a tiny needle is used to inject botulinum toxin A into multiple sites in the bladder. The botulinum toxin A works to paralyze the overactive bladder muscle, thereby reducing urinary frequency, urgency and incontinence.